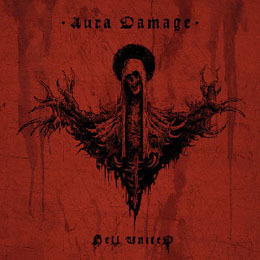 Polish Death-combo Hell United (Rzulty - g and lyrics, Void - v, g, Bartollo - b, and Dugy - d) did record Aura Damage at Roslyn Studio (engineering, mix and mastering) with Krzysztof Godycki. With Aura Damage, this band gives another example of Poland’s superiority when it comes to magisterial, massive, colossal, gargantuan, power-with-superlatives no-nonsense Death Metal. What an intensity; yet at the same time the whole gets performed as one cohesive eruption of technical professionalism. The usual Blast-assaults -cf. Poland as written above- yet with fine-tuned but subtle and delicate own-faced additions, and a nice dose of tempo-changes (including come-thee-well speed-decelerations), plus a totality drenched in a rough, unpolished yet well-equilibrated sound, giving the whole album a morbid atmosphere that dwells in between Post-alike horrific visions and semi-grinding Hell-thrashing! Do I need to go on?